Through an arrangement with Abbot Gregor of the Monastery of St. Ioan in Suceava Rumania we are proud to finally be able to offer direct, personal Scriptorium services. For a small fee we can now replace your current laser or inkjet printer with a genuine Monk™ (similar to the one pictured below) fully trained in Greek, Latin and Hebrew transcription and multiple calligraphic styles. Monks™ require minimal maintenance and are available in Ukrainian, Moldavian, Serbian and Coptic varieties. You also have your choice of beard styles, lengths and colors. Just provide your Monk™ with a bowl of gruel and a flask of water and make sure he has plenty of ink available and you’ll be able to produce many pages of attractive, scriptorium-quality output before he has to be replaced. Unlike temperamental and noisy inkjet and laser printers, Monks™ have taken vows of humility, chastity, obedience and silence. They are used to physical mortification so they are durable and respond well to discipline. 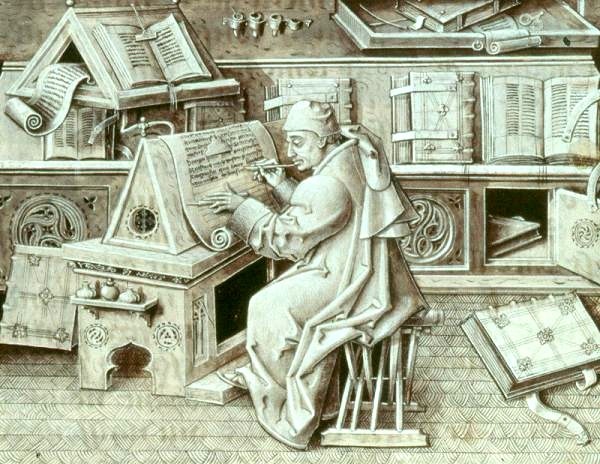 Monks™ are guaranteed to perform at an output level of 3 pages per hour in text mode or 1 page per hour in full-color illumination mode. When your Monk™ is worn out, just place him in the handy plastic recycling bag and ship him back to the monastery to be recycled. A fresh monk will be sent back by return mail for a discounted replacement fee. Monks™ carry a full warranty, but the sanity clause in the warranty will be voided if you require copies of unholy texts such as the Necronomicon, De Vermis Mysteriis or the Pnakotic Manuscript. Don’t be stuck in the Dark Ages! Order your Monk™ today.